Schnauzers Rule takes pride in offering our visitors a wide variety of free informational, educational, and entertaining stories about the Miniature Schnauzer. As much as I love doing so, I am running this website as a business and therefore want each of my readers to be informed that although the information I provide is FREE, I do accept compensation from advertisers and affiliates. After stating that, let me assure you that this in no way influences the content, topics or posts made on Schnauzers Rule, or on the Schnauzers Rule blog. Payment is never ever accepted for a review or product. Publication of ads Advertisers pay for a space on our website as a means of reaching a broader audience and possibly expanding their customer base. Visitors are provided links to these products and services solely as a courtesy. 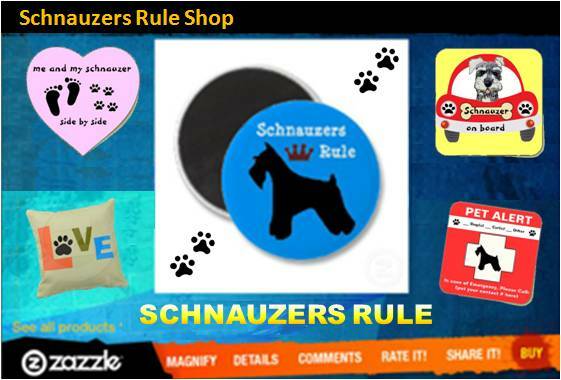 Schnauzers Rule does not express or imply endorsement of any products or services featured on our website. You may click on this link, if you would like to read about advertising on Schnauzers Rule. Product Links or affiliate links on Schnauzers Rule, are also provided as a courtesy, however we do receive a small commission should you decide to purchase a product(s) through the linking process. Most, but not all, of my affiliate merchants are clearly posted on the Dog Offers page. Another participating affiliate is Amazon.com: Schnauzers-Rule.com is a participant in the Amazon Services LLC Associates Program, an affiliate advertising program designed to provide a means for sites to earn advertising fees by advertising and linking to amazon.com. Any problems or complaints with any of these products or services must be handled through the affiliate or advertised site. Schnauzers Rule does not accept any responsibility for any loss which may arise from any information, products, or services offered by any advertised or affiliate site. Google Ads are used throughout the site as well, to offer viewers other site options that may be of interest. When visitors link to these sites through Google, I receive a small amount of compensation. Google Ads are clearly marked on each page with "Ads by Google". Any Google ad or page by the same product or service offered elsewhere on this site is purely by coincidence. Product Endorsements & Claims: I do my very best to provide my visitors with only high quality products and services that I think may be of value to you. However, claims and endorsements found on this website are coming from the manufacturer or advertiser directly. Links are therefore provided for you to confirm, verify, and further review with the manufacturer, provider or advertiser yourself. Be aware that I have not necessarily tested these products or services myself. The claims are not mine nor should they be considered as endorsements from Schnauzers Rule. I just want to say a big thank you to all my visitors. It not only costs me money but takes me hours upon hours to provide you FREE quality content, that is current, original, and informative about the Miniature Schnauzer. Without your continued support of my sponsors I would have to charge you to read this information or shut down my site. And I want to do neither. So please continue to support my advertisers and help Schnauzers Rule become the number one Miniature Schnauzer Dog site on the web. And let me further state, by linking on any product or advertising campaign, in no way costs you a dime - it only helps me earn a small commission so I can continue providing you this FREE informative website. I also want to take this time to thank you for all your feedback, tips, opinions, contest entries, and for being such loyal readers. I truly value your trust, loyalty, and support.